Rashmi, Alternate nostril breathing is certainly a calming breath. Thank you for your question about your right nostril being more dominant than your left nostril. Your nostrils go back and forth in dominance throughout the day. It is also a great breath to balance the left and right hemispheres of your brain. The term hatha yoga can be broken down into ha for sun and tha for moon. It is all about balancing the solar and lunar or masculine and feminine energies of our body and mind. One of the ways that this happens is by balancing the flow of your breath through your right and left nostrils, which are connected through the Ida (Solar) and Pingala (Lunar) channels of your body. Dr. David Frawley explains that your breath quite commonly flows more through one nostril than another at any given moment in a day. In fact, your breath will switch back and forth at from one nostril to another at different times of the day. This switch back and forth is a reflection of your energy, activity, and awareness. It is another way to check in and ask yourself, what is happening now? Your right nostril carries a warming solar energy. This is your Pingala Nadi. When your “ breath flows mostly through your right nostril it is good for digestion, circulation, exercise, movement and other more dynamic activities that result from increased heat in your body.” (Frawley, Neti: Healing Secrets of Yoga and Ayurveda, pg. 46). When you are breathing through your right nostril it relates to the left hemisphere of your brain. The left hemisphere of your brain governs rational, perceptive and masculine qualities. Perhaps Rashmi was practicing in the morning. Your right nostril channel should be more active in the morning so you are more energized. Your left nostril on the other hand is related to more cooling and lunar energy. When your breath flows through your left side of your nostril (and body), it is good for relaxation, sleep, the building of tissue and anything soothing. 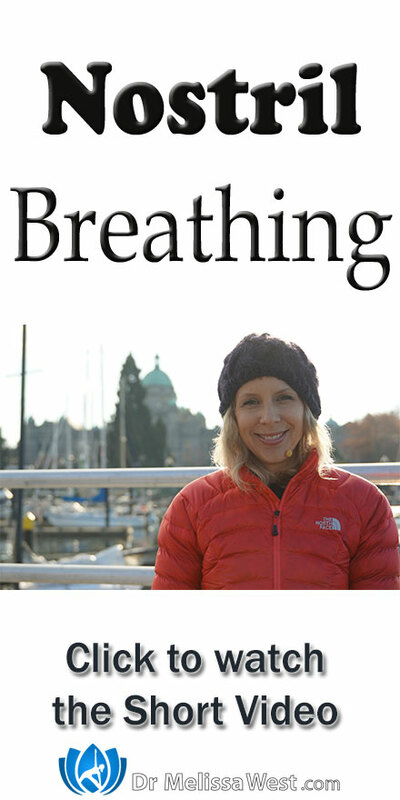 When you are breathing through your left nostril it governs the right hemisphere of your brain which relates to emotional, receptive and feminine qualities. From a spiritual perspective the when your right nostril is open you are developing Shiva energy, the cosmic masculine force. When your left side of your nostril is open you are developing Shakti energy, the cosmic feminine force. Resource: David Frawley: Neti: Healing Secrets of Yoga and Ayurveda.